A faint humming noise can be heard as brightly colored plastic yo-yos are thrown into the air before landing on a taut string held between two sticks. Barbell-shaped and hollow, the unique toy provides a source of entertainment unlike any other. 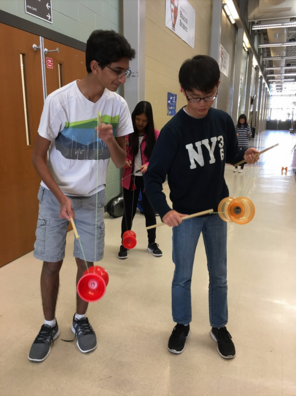 The art of Chinese yo-yo has been around for centuries, and still continues today in Chinese yo-yo club. Stephen Shiue ’19 shows off a unique yo-yo trick. Every second and fourth Thursday of each month, students gather to learn challenging new tricks while perfecting dazzling routines. Unlike the usual yo-yos, the Chinese yo-yo is unattached to the string, allowing versatility and a world of possible tricks. 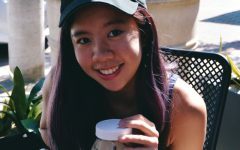 The club, founded by Stephen Shiue ‘19, began as a way for others to explore Chinese culture. Since then, many more members have joined, eager to learn about the popular pastime. Shiue entered his journey with Chinese yo-yo from a young age, taking lessons at The Love of China School of Dance. Many of the club officers began the same way — by taking classes at Chinese school. Shiue teaches a new technique. 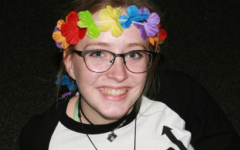 Each club meeting consists of officers and more experienced students helping the new members learn tricks that involve spinning, tossing, and even jump roping with the yo-yo. 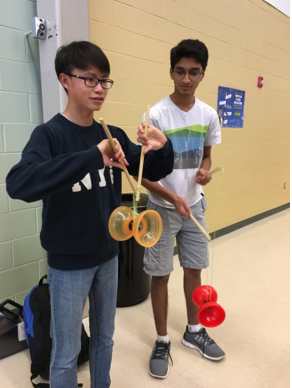 While Chinese yo-yo club hasn’t performed as a group before, they plan on displaying their talents in the Taste of Asia show on Friday, March 3.